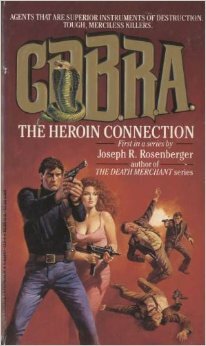 A character says, “This is not Africa and you’re not with Mad Mike Quinlan and his Thunderbolts.” The following comparison is made by Jon Skul: “There was only one other man as talented, and possibly more adept at quick-killing, that shadowy and legendary figure known as the Death Merchant.” The reference to Rosenberger’s other series character Richard Joseph Camellion, aka the Death Merchant, brings C.O.B.R.A., a covert government agency operating outside the law proper, into the CU. Mad Mike Quinlan and his Thunderbolts are also from the Death Merchant novels. Just how many covert government agencies are there in the CU? It almost seems like they'd constantly be tripping over each other. CURE, Stony Man, AXE, BPRD, Delta Green, Bureau 13, the Department of Military Sciences, and Matt Helm's unnamed organization. Isn't Buffy's Initiative also U.S. government? Is Alias (the show with Jennifer Garner) in the CU? If so, that would also bring in APO. Is James Rollins's Sigma Force in the CU? It's a U.S. government outfit, too. Alias and Sigma Force are both in the CU. In Britain, we have W.O.O.C.(P.) from Len Deighton's Books, Department Z from John Creasey, the Diogenes Club in several series. There's the Double 00 section of the British Secret Service. While I am not sure it is ever stated, Bond probably works for the real Secret Intelligence Service (SIS or sometimes MI6). The 00 section is probably fictional though. John Drake works for MI9 which was the British propaganda department during WWII, but is a full fledge spy agency in Danger Man. There's also Stephen King's Shop. S.H.I.E.L.D. isn't a U.S. government agency, though. But is S.A.F.E. in the CU? It's the U.S. version of S.H.I.E.L.D. that was introduced in the 90s Marvel novels. Don't forget there's also the Library from the Librarians series, but I don't think it's affiliated with the U.S. government, either. The same goes for the G.I. Joes, right? G.I. Joe was a US Military agency in the comic and cartoon. The movie made it international, probably because so much of its revenue comes from abroad. I meant to say the movies revenue, not the fictional organization G.I. Joe's.